This week we’re running an internal safety campaign – Drive Safe Week. The safety and wellbeing of our communities as well as our people is central to what we do. 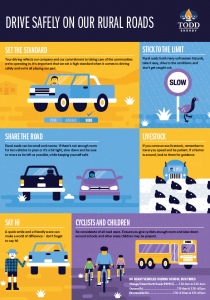 Drive Safe Week allows us to focus on six safe driving principles for rural roads, supporting the safety of our people and our local communities. From Monday 19 February – Friday 23 February we’ll be spreading this important safety message across the business. The focus areas were designed in conjunction with local community feedback to support the safety of all road users. We value the open dialogue we have with our community, and if you have any feedback relating to the operation of our vehicles, please contact our Community Team on 0800 001 007.